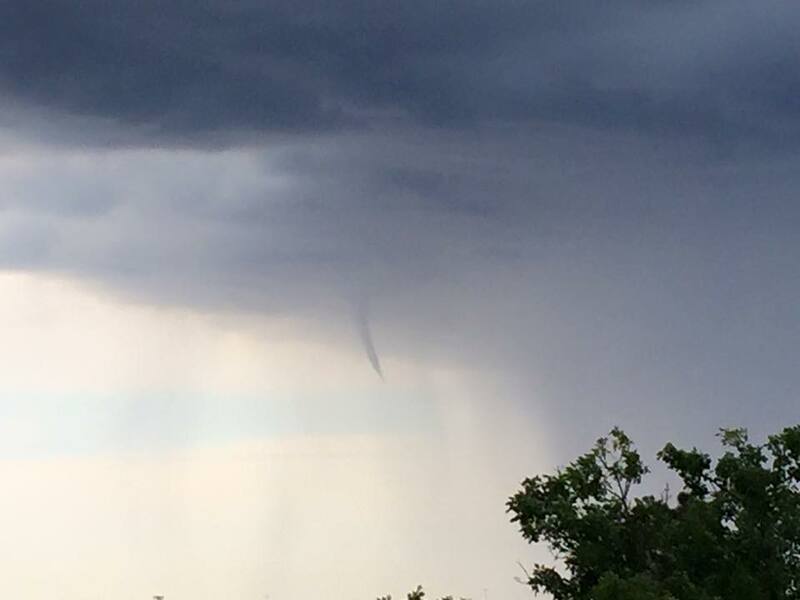 Last year at this time we were dealing with unexpected funnel clouds in the sky! This week doesn’t look nearly as exciting from a severe weather standpoint but we do have some weather changes coming. After turning the heat up to start the week it looks like we’ll be turning the thermostat back down to end it. Surface observations are picking up on a cold front diving South out of Wyoming this morning and this front is expected to make its way into Colorado later today. 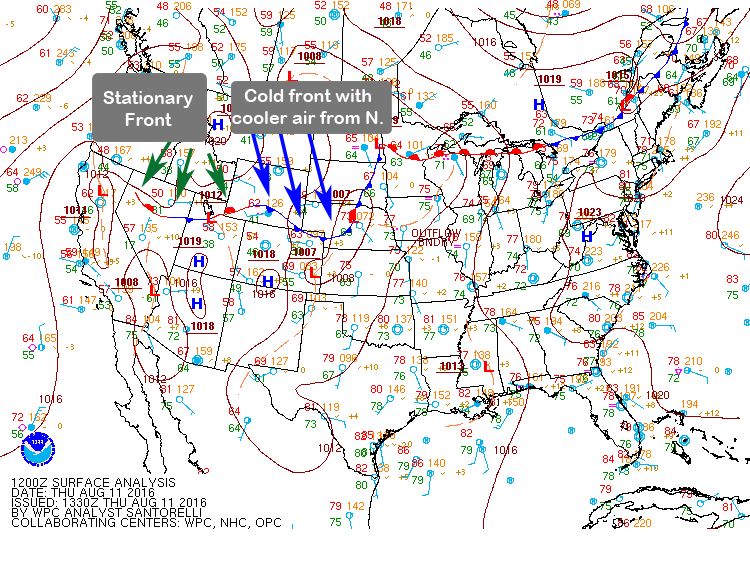 Surface observations with fronts and systems as of this morning. The front runs along a line from roughly Reno Nevada, across Utah (with an associated low pressure system) through Wyoming and the very Northeastern tip of Colorado, up in to the Eastern Dakotas. The tail end of the front is stationary so areas into Nevada and Utah won’t see most of the cooler air. Colorado however, will see a decent cool down into Friday and Saturday. Models and Chances for Rain? As with last week’s storm system, we will have an increased chance for moisture along the front range but for many areas it will be hit or miss. Overall, I’m not terribly impressed with the precipitation potential with this system, it just doesn’t look like it has decent setup to tap into good monsoon moisture or anything from the gulf. We’ll start with the NAM, mainly because I like it better than the GFS (I could explain why, but that’s an entire article by itself.) The NAM puts the bulk of the moisture in northern areas such as Cheyenne and areas South of Pueblo towards Southern Colorado. Keep in mind, this is total quantitative precipitation from this morning so it can include any rain we get from thunderstorms today. 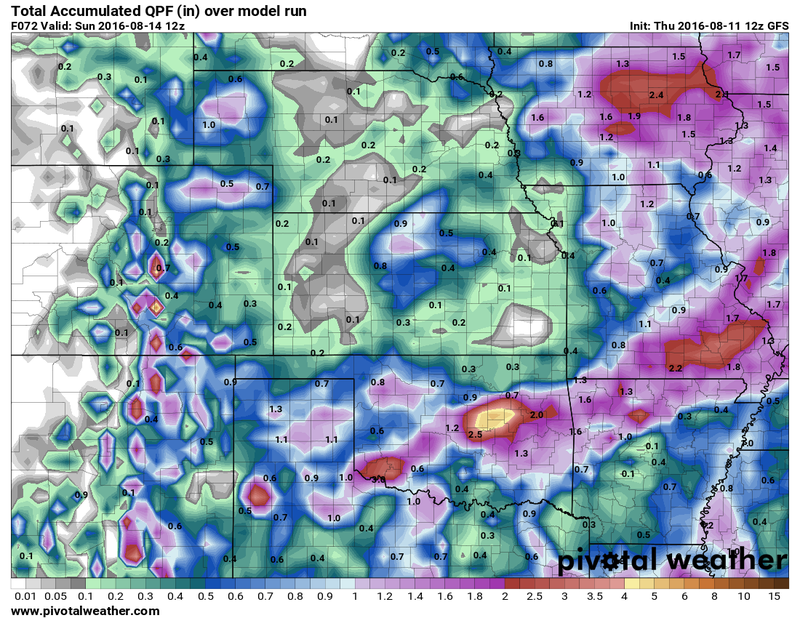 Pretty unimpressive as far as moisture totals are concerned for the bulk of Colorado. The GFS has a relatively similar solution, the only change I notice is the higher precip totals along the Southern areas of the Palmer Divide and the shift of the Northern moisture slightly South from Wyoming into Colorado. The GFS is not known for being the most accurate around but if it is picking up on higher moisture along the Palmer Divide that is at least something to keep in mind. 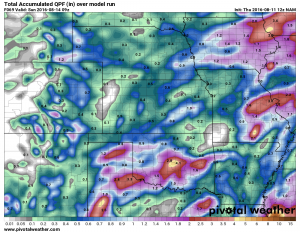 After last week’s total bust on moisture, I decided to take a closer look to see if the models were blowing smoke again and if we could end up wetter than predicted or completely dry for this storm system. Ensembles are useful as they combine data from a whole range of models together into one product and can help bring some clarity to murky models. The difficulty here is the ensembles don’t run for the Castle Rock area, their models are based on data from Centennial Airport and Monument. As we all know, the weather at both those locations can be very different from Castle Rock, so I tend to take an average between the two. The ensemble that runs for Monument Hill shows the area getting nearly an inch of precipitation through Sunday. This would be more consistent with the earlier mentioned GFS model… interesting. The Centennial Airport based ensemble shows less moisture, closer to 0.5 or 0.6 total. This is higher than both models have predicted in the area. This is also interesting, in both cases the ensembles are wetter than the two big hitter models I’ve shown above if only slightly. This situation is a classical “evolving forecast” scenario where we don’t have models agreeing too much on the amount or location of moisture. I tend to side more with the ensembles in general, the problem is they can change drastically to match with the models at a later time or they can go their own way. The models are great at picking up longer range stuff but the ensembles are better are short range. Conversely the ensembles don’t always do well at longer ranges. I’ll take a look at all the models and ensembles again Friday morning and have an update along with the weekend outlook. As of right now, I see about 0.3-0.6 inches of precipitation for the Castle Rock area through Sunday (this may or may not change with more data) Most probabilistic forecasts had only a 20%-40% chance of any rain at all for the area on Friday and Saturday so this is why I’m leaning lighter on rain accumulation at the time. I’ll have another look at the data Friday morning and see if anything changes, happy Thursday! It just goes to show you how unpredictable Colorado’s weather can be and why I love forecasting and storm chasing it. The weather here can humble even the most experienced meteorologist and is why I think there is no better place to observe and forecast weather!